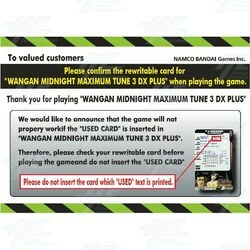 Namco have released a statement warning Maximum Tune 3 players not to insert their used player cards into Wangan Midnight Maximum Tune 3 DX Plus machines. If a player tries to use their used card to create a new card, the new player card will also be printed as 'USED' and the player data will become invalid and unable to be used. A player card will become used if the data has already been transferred over to a new card or it has expired. Used cards can be easily identified by the word 'USED' at the top of the card. Namco are currently investigating the cause of this problem and will release a countermeasure as soon as possible. As a precaution, the factory has prepared an announcement sheet to be displayed next to the machines. If you are currently operating Wangan Midnight Maximum Tune 3 DX Plus machines, please contact our sales staff for a copy of this announcement sheet.